We were driving through town this morning on our way to pick up a friend of the kids for the day .. and on our way, we passed the old granary in town. It’s a cold, gray and rainy November day but love how it made this whole scene appear. 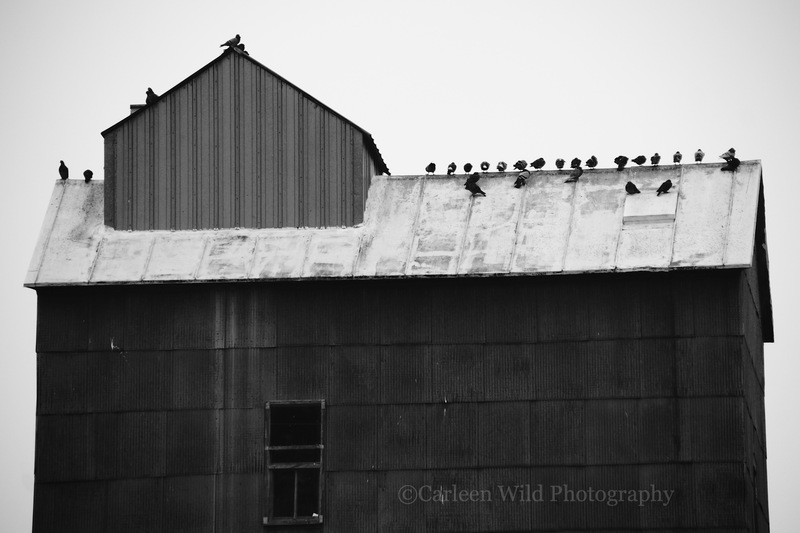 Pigeons atop one of the old granaries in downtown Flandreau. This entry was posted in Photography, South Dakota and tagged Flandreau, Old granary, Pigeons, South Dakota by Carleen Wild. Bookmark the permalink. [ Smiles ] Those pigeons are enjoying the best view. Lovely monochrome picture, by the way! Pigeons provided many families with food through the winters, back in the day. Old World Wisconsin has a barn with notched out area under the eaves that provided a roosting/nesting spot for the birds, and made them easier to “harvest” for the family’s meal. This shot reminds me of that.